The dramatic, worldwide loss of biodiversity is one of today's greatest environmental problems. The loss of species diversity affects important ecosystems on which humans depend. Previous research predominantly addressed short-term effects of biodiversity in small experimental plots planted with few randomly selected plant species. These studies have shown that species-poor plant assemblages function less well and produce less biomass than species rich systems. Researchers participating in the University Research Priority Programme "Global Change and Biodiversity" of the University of Zurich now demonstrate similar positive effects of biodiversity in real-world ecosystems in which mechanisms different from the ones in artificial experimental plots are at play. 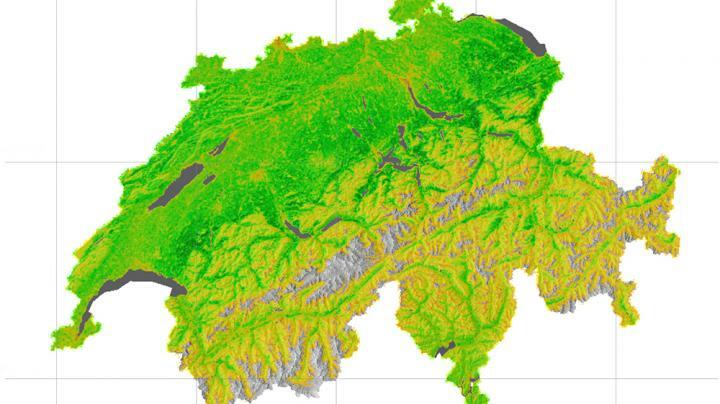 Using 450 different 1-km2 landscapes that spanned the entire area of Switzerland, they investigated the role of the diversity of plant, bird and butterfly species for the production of biomass, which was estimated from satellite data. "Our results show that biodiversity plays an essential role for the functioning of extensive natural landscapes that consist of different ecosystem types such as forests, meadows or urban areas", study leader Pascal Niklaus from Department of Evolutionary Biology and Environmental Studies says. The analyses showed that landscapes with a greater biodiversity were more productive and that their productivity showed a lower year-to-year variation. The satellite data analysed by the scientists revealed that the annual growing period increased in length throughout the last 16 years, an effect that can be explained by climate warming. The prolongation in growing season was considerably larger in more biodiverse landscapes. These relations were robust and remained important even when a range of other drivers such as temperature, rainfall, solar irradiation, topography, of the specific composition of the landscapes were considered. "This indicates that landscapes with high biodiversity can adapt better and faster to changing environmental conditions," Niklaus concludes.